The first thing to note is that the World War 1 service records available are not complete. 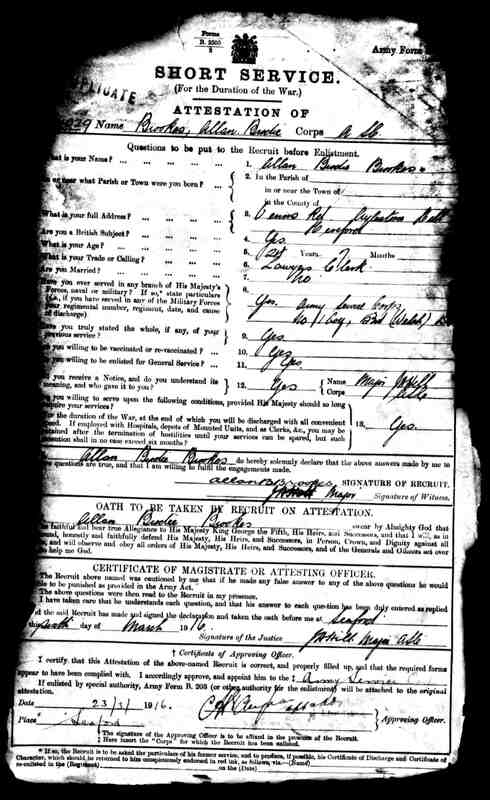 I had pictorial evidence that showed my great – grandfather served in WW1 but could find no service record. In the end I found out about his regiment and where he was stationed through his divorce papers! In 1940 there was a World War Two bombing raid on the War Office in London where the records were held. During this raid approximately 60 percent of the 6.5 million records was destroyed by fire. The surviving service records suffered water damage following the bombing raid, all but were microfilmed by The National Archives. Some are ragged and difficult to read but if you do find one for an ancestor they are a great source of information. There is a free index of WW1 service records at FamilySearch but to see the images themselves you will either need to be a paid member of Ancestry or Findmypast, or to go in person to the National Archives at Kew. Service records for soldiers serving in the armies of Commonwealth countries (such as Canada, New Zealand or South Africa) will be located in their respective archives.